Be part of one of the fastest-growing industry segments in the world. Hotels, resorts, restaurants, cruise ships, casinos, entertainment venues and conference centres are all benefiting from an increasing number of travelers from around the globe. Learn the essential operational skills and management techniques that employers value in this vibrant business. Explore the diverse career paths that are available to you, as you unleash your passion for customer service excellence and profitable hospitality business operations. The world of accommodation, food and beverage, travel and tourism is yours to discover. Teamwork, effective decision-making, critical thinking and leadership skills are explored in Year 1 and also emphasized throughout the second year of the program. You will also participate in a capstone course in Semester 4 designed to provide you with an opportunity to apply the skills you have acquired throughout the program as you operate a full-service hotel through a robust simulation program. To develop a better affiliation with industry and further your skills, you will be invited to apply to the co-op option during your first semester. Qualified students will complete a four-month, paid work term in the summer between the second and third semesters of the program. Students can also choose to complete an 80-hour field placement to gain work experience during their fourth semester. 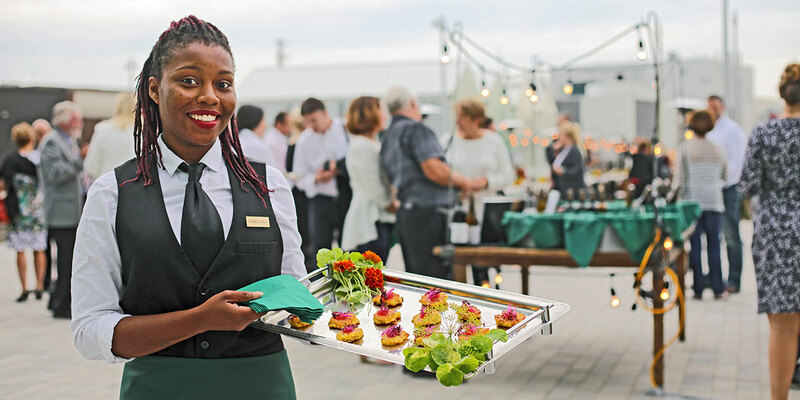 The Hospitality - Hotel and Restaurant Operations Management program is offered at the Whitby campus, home of the college’s new W. Galen Weston Centre for Food. This incredible new learning environment provides access to state-of-the-art labs, classrooms and meeting spaces all designed to offer you the best possible learning experience. Students completing a field placement will participate in an 80-hour, unpaid work experience in the fourth semester. This will provide the opportunity to integrate theory with practice under the supervision of an industry professional. Students work at hotels, restaurants, catering companies, food service operations, golf courses, tourism operations or other locations, applying their skills from the classroom on the job. From student-focused special events, to employment in the W. Galen Weston Centre for Food’s restaurant and catering operations to special projects, there are countless opportunities for students to further their learning beyond the labs. Students starting in the Hospitality – Hotel and Restaurant Operations Management Diploma program in September will be invited to apply to the co-op option during their first academic semester. Entrance to the co-op option is limited and the processes for securing a work term are competitive. Students who qualify for co-op will be eligible to complete a four-month, paid work term between the second and third semesters of their program. The co-op work term will provide students with work experience in the accommodation, food, and beverage, and travel and tourism industries. The co-op work term expands students’ learning environment to real work settings where they will be challenged to apply their academic knowledge and then return to campus with a deepened understanding of industry demands and required skills.